I'm pawing through wine bottles at a party. People around me are clinking glasses, smiling, chatting in French and Portuguese and Spanish, but I'm grimly grabbing one bottle after another. This was my quest to identify my second-favorite wine in Brazil. Admittedly it's not exactly scaling Mt. Kilimanjaro. I participated as a judge in the Concours Mondial de Brazil, an offshoot of Europe's leading wine competition. We judged blind and at the time of the after-party we hadn't received the results. I remembered two wines that I loved, a Cabernet Franc and a Viognier. But all we knew was the grape (or "blend" -- just that, "blend") and vintage. The Cabernet Franc was easy to identify: we tasted only three Cabernet Francs, and only one from 2009. All I had to do was paw through three tables holding more than 300 bottles to find the one meeting that description -- and it didn't matter if it was empty or not. But we had judged three 2010 Viogniers. So I had a sense of urgency, as there was a reason these bottles were on these tables: people were drinking them. I knew that if somebody discovered my favorite Viognier before I did, there was a good chance it would be passed around and emptied before I could verify its identity, because it was one of the best wines in Brazil and my fellow partiers were all wine judges. You ever seen how quickly a crowd of professional drinkers can empty a bottle that stands above everything else? It's like piranha on a pata negra pig: Mmm, tasty. Hey, where'd it go? One thing in my favor: Not all of the bottles were open. As most of us have sommelier credentials, the party organizers had just laid out the bottles, and people were pointing out things they wanted to try. Most hadn't bothered to bring their own corkscrew. But I came to this party on this quest, so I was armed and ready. It took me at least 20 minutes to locate the first two 2010 Viogniers. Neither was open. Each time, I grabbed the bottle, scurried to a quiet corner, popped it open and tasted. Immediately I knew I was wrong. The second time I did this, one of the judges asked me, "What have you got there?" in French. I think. Given my command of French, he might have been asking what social disease I had contracted that encouraged me to hide in the corner at a party. Or maybe it's the same question. I looked and looked and couldn't find the third Viognier. I checked and rechecked. Finally it dawned on me -- look at the bottles people are waving around as they talk. Sure enough, a fellow judge was using it to visually demonstrate trellising. Or something. I stood behind him like a haute cuisine waiter, in mountain pose, ready for action. He put the bottle down, perhaps briefly he thought, but I slipped a hand in like a ninja and whisked it away. 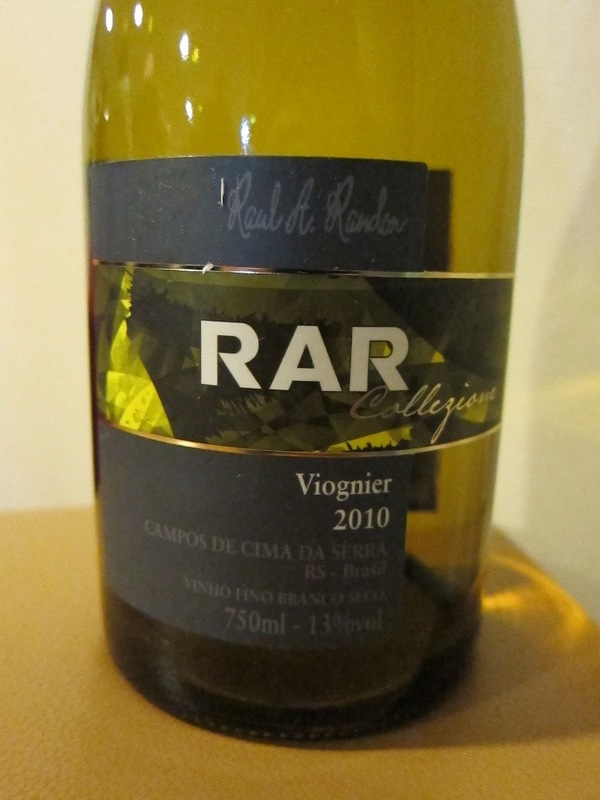 The wine in question is Campos de Cima Da Serra RAR Collezione Viognier 2010. It was a reasonable 25 reals (about $14 US) in Brazil, if you can find it. And despite my love for it, it won only a silver medal. The Miolo wine group, one of the largest wineries in Brazil, made the wine, but the really interesting story is the vineyard, which was planted by Raul A. Randon, one of Brazil's most successful entrepreneurs and a wine lover. This is just the sort of damn-the-expense profligacy Brazil needs to make world-class wines from scratch. "It was a dream of Raul Randon to produce fine wines," said Daniel Alonso, an enologist for Miolo. So Randon planted in a remote, high altitude (1000-meter) and unusually dry area of southwestern Brazil, with hot summers, extreme diurnal temperature variation and very little rain. "Most of Brazil has problems with rain," Alonso said. "The grapes are 250 kilometers from the winery, but the vineyard is in a special place." The wine spends 12 months fermenting in French oak barrels, but the wood is merely a slight accent. This Viognier has delightful fresh and dried apple fruit with floral hints. There's some richness on the mouthfeel but the acidity drives it, and it's a reasonable 13% alcohol. It's a world-class wine, about a 91-pointer, and an amazing value at 25 reals, although it seems clear to me from the production process that Randon is not making money on it. Still, the man wanted to make a world-class wine in Brazil and he succeeded. The one wine I liked better got a gold medal, which means my fellow judges agreed with me about the Pequenas Partilhas Serra Gaúcha Cabernet Franc 2009. It's a lovely, juicy Cab Franc, with a nose of dark plum, dark chocolate and fresh herb, great acidity and balance. The largest winery in Brazil, Aurora, made 1200 cases of it, so it's not quite as hard to find -- in Brazil -- as the Viognier. Unfortunately I didn't speak with anyone from Aurora so I didn't get the story of the wine, or the price. And I doubt that I'll ever have the chance to drink it again. But when I think of the potential of Brazilian wine, I'll remember these two. Read my column about Brazilian wine at Palate Press. I'm from Brazil, it's really cool to read your detailed column about the wine industry there. 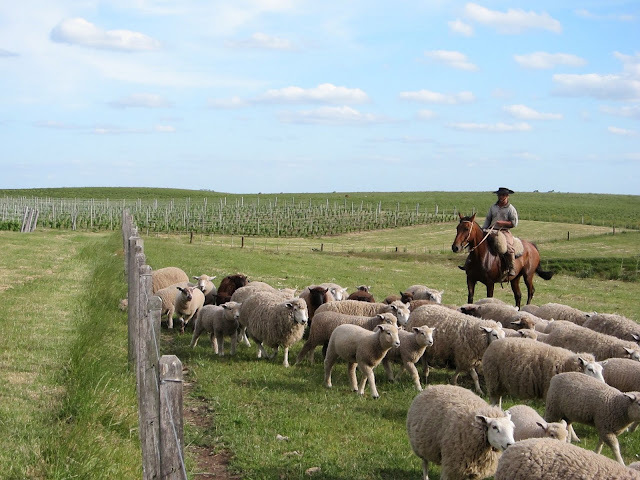 Initially it was believed that the best land for wine in the country was in a region called Serra Gaucha where all the Italian immigrants built their wineries. It is my understanding that most of these wineries were sold to International corporations. They recently discovered, as you noted, that the terroir in the Campanha (further South) would be better for Viticulture. The problem is they need to transport the grapes from the Campanha to Serra Gaucha(where the wineries are) for Vinification. I think the day they build the facilities to vinify the wine in Campanha the wines are going to get much better. I read that you visited Campanha. Did you see wineries there or they were mainly tasting rooms with the wines being vinified elsewhere? Hi Dapz, thanks for your comment. I visited wineries and vineyards in Campanha; the only tasting room I went to was attached to a winery. There seems to be a bit of a winery building boom, but everything is booming in Brazil, as you know. Considering the wealth of the country and the low amount of wine being drunk now, the future growth of the wine industry is really potentially great. The Viognier in particular also made me think that there will be better wines than anyone currently realizes grown in places people haven't been using up to now. I suspect you are right. In the immediate northern state of Santa Catarina, there is a region (Vale de Sao Joaquim) that is much drier; it even snows sometimes, Please note that I say this without any knowledge of the geology of the place. But I know they are making wine with some success over there. Travelling all the way to Brazil to search for their finest wine is definitely an adventure. I enjoyed reading this post and I am hoping to read more of your wine escapades!